UNLOCK Innovation with the IQE Assessment. Then, SUSTAIN it. Make your innovation initiatives sustainable and affordable with easy-to-use, online micro-learning. Designed for busy professionals, the IQE PRO TOOLKIT simply works. SCHEDULE A TIME. TALK TO US ABOUT YOUR INNOVATION CHALLENGES. Takes the BIG FIRST STEP with our proprietary Innovation Quotient Edge assessment and learns their Innovation Archetype. Accesses on-the-go micro-learning with 3-minute video lessons that tie IQE Power Triggers with actionable tools. Gets weekly emails reinforcing innovation, keeping it top of mind. Can access the IQE Pro Innovation Toolkit 24/7. With innovation tools, resources and interviews, your team has access to what they need in the moment. Can take advantage of interviews with top innovators and leading entrepreneurs across a range of industries for both inspiration and great ideas. Incredible value. We designed our IQE Pro Innovation Toolkit to be cost-effective as well as engaging. Mindset Shift. Move innovation to an ongoing mindset that everyone continues to use. 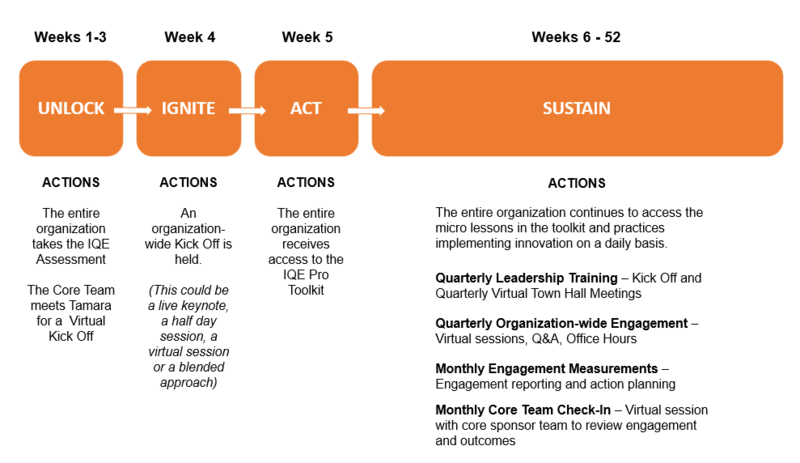 Sustainability: The IQE Pro Innovation Toolkit supports any of your initiatives - LEAN, AGILE, DESIGN, and more. Launching and abandoning an initiative becomes a thing of the past. A viable means of moving the company and each team member towards more growth and success. REQUEST A TIME TO TALK TO US ABOUT YOUR INNOVATION CHALLENGES. Need a more customized solution? We've got options. Let's talk! When two teams can't work well together, it's hard to achieve objectives let alone drive breakthrough innovation. That's exactly what two teams at Wendy's, the global fast food brand, were facing. While there were strong individual players, the lack of teamwork led to incremental thinking that wasn't moving the needle. The teams consistently fell short on their objectives of creating and bringing to life the breakthrough ideas Wendy's needed to compete and win in an industry that changes overnight. The teams struggled and needed a tool that would help them create a stronger culture of trust, collaboration and innovation. Wendy's started with a DIY Innovation Quotient Edge (IQ) Workshop. Leadership recognized that in order to overcome their team challenges, they needed a tool and process that would help them connect and build a culture of innovation - one that would create a sense of trust and a foundation of innovation with which to move forward. With the support of the LaunchStreet team, Wendy's leadership led an IQE workshop. Each team member took the assessment prior to participating in a 2-hour workshop. The results are in and they are as delicious as the fresh beef! According to Wendy's leadership, the teams walked away empowered to not only work together but also innovate. Each person not only understood their unique innovation superpowers, but also how to tap into the powers of those around them to drive innovation. The teams overcame the major obstacles holding them back. They built trust and began understanding how their teammates contributed to their goals. With a newfound understanding of how they add value and a deeper appreciation for those around them, the teams are now ready to get after innovation that will help Wendy's compete and win. Each team member taps the power of their Innovator Archetypes each day and innovates on demand. Wendy's has gained their innovation edge.